Just a few blocks from the courthouse in Gallatin, MO, sets a building known as the Daviess County Rotary Jail, an 8-sided brick structure attached to a 2-story house. Years ago wards of Daviess County stared through the barred windows or passed the time of day with children from the school across the street. They saved their orange juice and put it in the window to ferment. Or they whiled away the long hours writing graffiti, poems, obscenities or their names on the walls. That all ended in 1975 when the jail was closed. But the structure remains as one of the most unusual means of housing prisoners yet devised. The idea for a circular jail tracs its origins back to an Englishman named Jeremy Bentham, whose panoptican prison was builtin in 1791 (a panoptican prison is built so that a centrally located guard can see all the prisoners). The design shifted to America in 1800 when a circular, cattlepin-like prison was built in Richmond, VA, by B.A. Latrobe. Another example was the Western Penitentiary in Pittsburgh, PA. 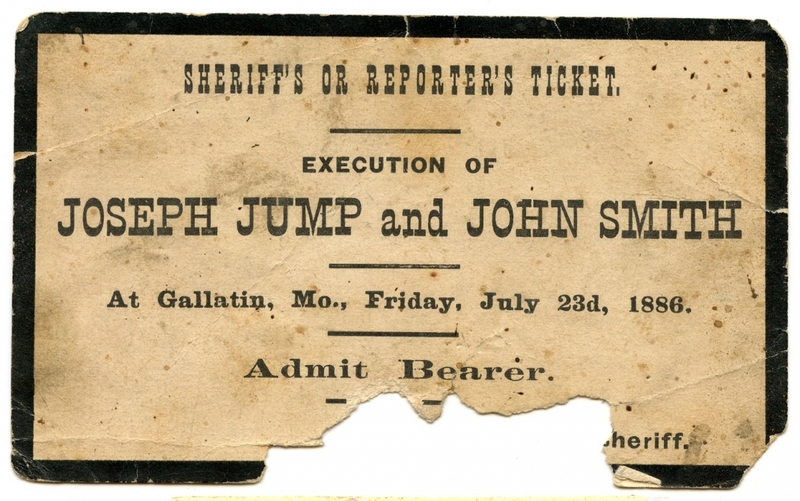 But the most direct ancestor of the Gallatin jail was created in July, 1881, when W.H. Brown of Indianpolis, IN, received a patent for a rotary jail. Brown’s idea was for a jail built on a revolving turntable like a lazy Susan. Solid iron, pie-shaped cells were laid out on the turntable. Bunks were placed along the partition walls, with heat and toilet facilities in the center. The entire turntable was surrounded by a circular wall of iron bars. There was only one entrace door in the circular wall, which could be opened only by the jailor. In order to get prisoners in or out, the jailor rotated the turntable, using a hand crank connected through a series of gears. When the right cell was lined up with the door, the lazy Susan stopped and the door opened by pulling on a lever. The Daviess County jail was one of several rotary jails built in the 1880s. In 1882 one was built for Nodaway County at Maryville, MO. Another one was built in Crawfordsville, IN, for Montgomery County. Council Bluffs, IA, added one in 1884-85, and DeKalb County, MO, followed with one built in Maysville in 1885. Of these five jails, only the ones in Gallatin, Council Bluffs and Crawfordsville remain. Gallatin differs in that it is the only one with the sheriff’s quarters attached at the time of original construction. While the jail is a unique piece of architecture, confinement in such a place bordered on curel and unusual punishment. The cells were tiny, 8-feet high and 7-1/2 feet long. The walls were solid, offering no communication between prisoners. Bathing facilites were located in the outer circle. The cots had no sheets — blankets only were used. There was almost no ventilation, and the iron floor was cold enough to drain the body of heat. Prisoners ran the risk of amputation if their arms were hanging through the bars when the cells were rotated. And the single exit and need to rotate the cells made the jail a death trap should the place catch on fire. Fortunately, this never happened in Gallatin. About the only good point at the jail was the food. The sheriff’s wife did the cooking for the prisoners. Mary Louise Appley, wife of Harold Appley, the last sheriff to use the jail, remembers feeding the prisoners the same things she fed her family. “I cooked like I did for my family,” she said. “There were almost no facilities for separate meals, so it was either one or the other. I made roasts, soups, stews — good food. And we didn’t get anything for it. They allowed you $2 per day to feed your prisoners. That was supposed to be for three meals.” Food was sent to the prisoners through a metal “grub hole” in the wall where prisoners were admitted. This room had a wood cookstove at one time, early records show. A lot had changed at the jail before the Appleys took over in January, 1969. In 1920 Gallatin put in a new sewer service, and the jail’s toilet facilities were updated accordingly. The turntable caused the jailors no end of problems, as the heavy floor caused the gear system to break down. After a time, the sheriff had to turn the jail like a top, literally putting his shoulder to the wheel. By the early 1960s, the county had enough of the antique contraption. A fierce debate raged in the county between those who thought the jail was unfit for human occupation and those who thought it should be kept intact because of its historic value. In the end, economics outweighed sentiment. The county just couldn’t afford to build a new jail. The turntable was removed in February, 1964. The inner circle of bars was cut up and sold for scrap. Some of it was used to build two big common pens and a single solitary cell (one piece of the iron bars turned up after being used as a cattle guard; it was returned to the jail site). In this fashion the jail was used until 1975. One pen held male prisoners; the other was for women or juveniles. Running the jail was hard work for the sheriff and his wife, Mrs. Appley remembers. At that time the county only had funds for the sheriff and a part-time deputy. So, the sheriff’s wife kept the books, did the jail work, and the dispatching. Most of the prisoners were local people, said Mrs. Appley. But that began to change when the interstate highway was completed. She remembers one man spending an entire year in the jail. “That was a worse term than if they sent him to prison for a year,” she said. Conditions got so bad at the jail that the circuit judge refused to put any more prisoners in it. So, Sheriff Appley condemned the building. After that, prisoners were taken wherever there was room in an adjoining county facility. There is a revived interest in the rotary jail. A grant from the National Trust for Historic Preservation is funding an architectural study. Another grant has been approved to nominate the facility for the National Register of Historic Places. The county has offered to deed it to the local historical society for a token sum so that it could be used for a county museum. But that group isn’t sure enough funds can be raised to make the necessary repairs. While the future of the structure may be uncertain, its place in architectural history is secure.